It is now commonly accepted that carbon fins make for the best freediving and spearfishing fins. But what is so special about carbon freediving fins and how are they better than other non-carbon freediving and spearfishing fins? Carbon fiber has some exclusive properties which make it highly suitable for use with freediving and spearfishing fins. It has an extremely high strength-to-volume ratio (which means it is extremely strong for its size) and a very high strength-to-weight ratio. 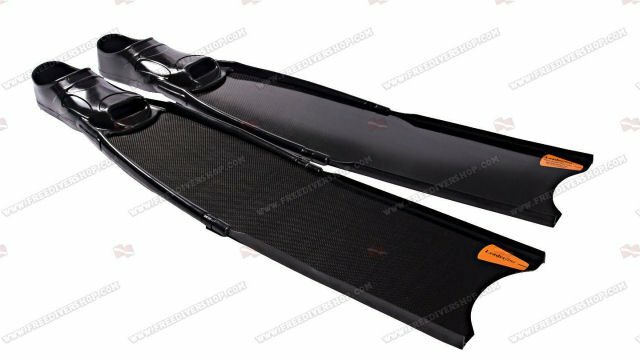 A freediving fin blade constructed of high quality carbon fiber is extremely light weight, very hard yet, in combination with the right resins, very flexible. 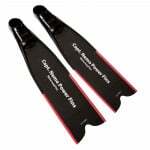 Why are carbon freediving fins better than non-carbon fins? Thanks to the unique properties of carbon fiber, carbon freediving fin blades can be bent relatively effortlessly while diving underwater. After the blade is bent, the carbon fiber material "wants" to go back to its original form - that is to be straight again, and it does so extremely rapidly. From the freedivers perspective, this would feel like kicking your fins takes very little effort, however the resulting underwater propulsion is very significant. This effect means that Freediving carbon fins have very high efficiency in propelling the Freediver underwater – they transform a very small amount of energy exerted to bend the fin blades into a large amount of kinetic energy (actual movement underwater). How are carbon freediving fins made? 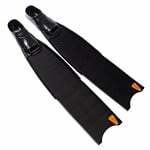 Carbon fiber starts it way as a carbon fabric in the process of making freediving carbon fins. The carbon fiber fabric is then put into a mould and covered with special mixture of resins which will enable the future fin blade to flex and bend without breaking the material. The carbon fiber fabric together with the mixture of resins is covered by another layer of carbon fiber fabric and covered again with the resin mixture. This process is repeated several times, depending on the desired stiffness of the blade. After having several layers of carbon fiber in the mould; heat, mechanical pressure (via industrial press) and/or vacuum are applied to the mould, depending on the specific method of production. This process fuses the different layers of the blade together to form a carbon fiber blade. The blades are then left to rest in the moulds before being removed and hand polished for a glossy finish and maximum hydrodynamic properties. Now the blades are fitted into matching foot pockets and viola! 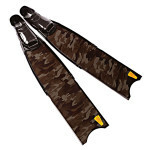 – we have carbon freediving and spearfishing fins ready for your freediving & spearfishing activity! Production time of carbon freediving fins may vary between 8-16 hours combined (this process may be spread over several days), depending on the fabrication technique and skill level of the craftsman. 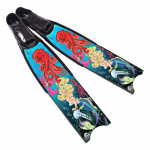 Which carbon freediving and spearfishing fins do you have available for sale?